Set of 6 Clear with Aqua Rim Hand Blown 8 oz Juice Glasses, "Aquamarine Kiss"
Aquamarine kisses the rims of six crystalline juice glasses. By Javier and Efren, this beautiful design is crafted with traditional blown glass techniques as the artisans transform molten beverage bottles into eco-friendly works of art. 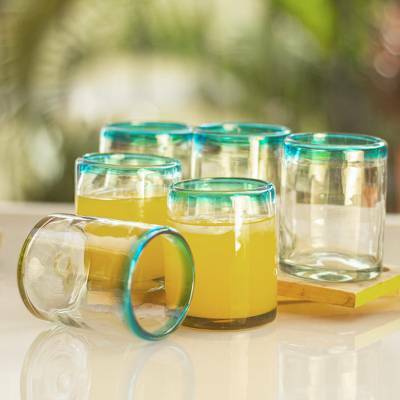 These are beautiful glassware that are a perfect size for juices and drinks. Easy to hold and sturdy for use with children and adults.